A great landscape photo is the sum of many parts. Vision, planning, execution, post processing. Each plays their role in creating a compelling landscape photo. Making The Shot videos take you through the entire photographic process. I share my entire process from envisioning a photo, planning the shoot and sorting out logistics, on location thoughts about composition and camera settings, and the final in-studio post processing work. 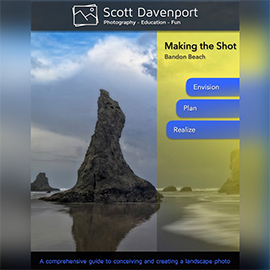 In this course, I’ll take you to Bandon Beach along the rugged and beautiful Oregon coast. I’ll share the planning steps I took before the shoot, explain my gear choices, and discuss how conditions on location shaped my composition choices. After the shoot, I’ll take you through shot selection and the end-to-end processing of my favorite photo. The course includes a practice image and a detailed post processing ebook so you can follow along, too. Making The Shot videos: An 8 chapter video course discussing everything from pre-visualizing the photo to post processing. eBook: A 23-page companion eBook for the video. The book contains composition thoughts and has step-by-step post processing notes on the selected image from the shoot. Practice image: Follow along with the post processing steps yourself. Note: This product is a digital download only, it is not available in DVD format. The video downloads are quite large. Your download includes the eBook, practice image and a PDF with instructions on how to download the full course at once or in smaller segments.